I was thrilled to be invited to be part of the blog tour for this second book written by authors Mary Elizabeth Kinch and Biz Storms. I own their first book and loved that so I knew this one was a must have. The book starts off with some wonderful examples of antique quilts and there are lots of tips and tricks throughout the rest of the pages that make sewing small pieces a snap. All the quilts are ones that I'd love to make but there are two in the book that call my name. As it happens, they're both string pieced but with different methods. The cheddar background in "Go With The Flow" is dynamic don't you think? 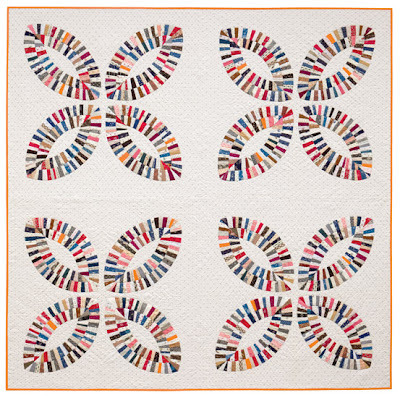 I also love the cover quilt, " Pumpkin Peel" which is a clever variation on two patterns I'm familiar with, Orange Peel and Double Wedding Ring. I thought it would be fun to try and do a variation of the Pumpkin Peel pattern. I started by thinking that a doll quilt size would be a great place to start. The block for one quarter of the quilt is close to forty inches which is bigger than I wanted to go. I decided to try shrinking the elliptical pieces to see if they looked workable and settled on a 60% reduction. That looked great but it also shrunk the seam allowance. I made some new templates out of plastic, excluded the seam allowances then used a quarter inch brass wheel to redraw them. I like to use a tearaway vilene for paper foundation piecing which I prefer over paper. I can see through it and it does come away easily with small stitches. You may not have noticed but I roughly drew some guidelines following the angle of the arc so that my strip piecing wouldn't go wonky. I didn't actually use the lines for stitching, just for angling my seam allowance on the strips if I needed to. Here's a tip if you do use paper. The ipad is a great little tool to have next to the sewing machine as it acts like a mini light table so you can check the pieces are lined up correctly. I'm loving the rhythm of paper piecing and it's looking pretty good to me. I'm thinking by now that if I do just the small arcs instead of the double arcs as in the pattern, that would keep the quilt small. I'll cut the background about 22" -24" which would be the size of the doll quilt I'd want. As you might know, red is my favourite colour so why not use it for the background? Then again, I love the cheddar too, what would you choose? Before I make that decision, I'll carry on and mark my seam allowances on the front ready to applique the arcs to the background. Here I'm using a Clover chalk pencil. What if I make a couple of the bigger arcs and see how they look attached the the smaller ones? I'm not finished playing just yet. If you'd like to win a copy of this book, all you have to do is leave a comment on this post and I'll choose a winner on August 19th. There's still a few stops on the blog tour for a chance to win a copy of the book plus I've included all the blogs that have participated so far. There are lots of tutorials, reviews, tips and fun interpretations of featured projects to check out. In addition, Mary Elizabeth has ten giveaways on her blog that is open until the September 25. Go here to enter. I also love small pieces. This book would be perfect! I love the method used on both string quilts. I've been wanting to do a string quilt and other projects seem to get in the way. Looks like an amazing book! This book looks like one I need in my library - thanks for the chance to win! I love the cheddar background, looks more peacefull. The cheddar background would be my first choice, Janet although I like the red as well. Big help I am, huh? I'd love to win a copy of the books. Sounds like a must have for my library. Thanks for the opportunity. I can't choose between the red and the cheddar. Maybe 2 little quilts??!!! I like the cheddar too. Looks like a great book. i'd love to win this book~! as hard as i try i can't seem to use up all of my scraps, especially the smallest ones. this book looks like it's chocked full of inspiration in that regard. i think that if you like red you should use red. i happen to really love cheddar so i might go that way if i were making it . . . btw: great idea for a doll quilt~! Your arcs are amazing. I'm sure you'll choose the perfect background...the red really caught my eye. The cheddar background on the quilt from the book is fantastic. Looks like a book anyone would love to add to their library. Thank you for a terrific giveaway. I am loving the arcs on the red. I already had to buy this book the second I found one. Just love it--almost as good as the first book!! I like the red background, but the cheddar steals the show. What a fun idea to shrink the blocks for a smaller quilt--will come back to check if you did anything with the second arc. Have a great week. I've seen this book on the other blogs, but you have convinced me that I want this book in my library. I'm always up for new techniques for piecing small bits. Thanks! Cheddar for me too...it's going to look great Janet. I've done a DWR quilt. but this small pieces string quilt looks like fun . Would love a copy of that book.. I love it with the cheddar. I would love to win this book. 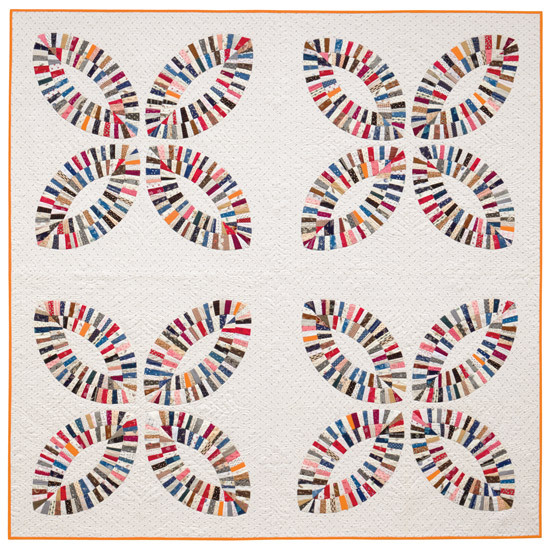 I really like the arc quilt. I love piecing quilts with small pieces. Which is good because I have a lot of small fabric scraps. Please include me in your giveaway. Thanks! P.S. I love the cheddar background best. I am in love with Cheddar myself but they both look dynamic. Anyway I would love the book because I love all old traditional patterns and designs and you make them look so gorgeous! I would love to win this book. It looks fabulous. Thanks for the chance! You wouldn't believe the tiny pieces I keep for little quilts! Thanks for the great iPad idea! I had not thought of that before. Would love to win the book. I like the red or cheddar Janet!! I love seeing your process. Oh, I love both of those quilts you've shown! Great use of scraps! And both cheddar and red look awesome with that Pumpkin Peel.....can't decide! Is vilene like tissue paper, like the stuff to wrap gifts in? Your arches are fabulous, Janet. I like the cheddar background! The book looks like a great resource. Some pretty projects. Thanks! I love the iPad tip! So clever! And your arcs are gorgeous. I can't wait to see where you take this next. that's an expensive light source... lol... I've been looking for a good light source. I have not done paper piecing, but it's on my list... if I had the right tools, I'd go for it :) Thanks for sharing! The book looks awesome! It looks wonderful both in red and cheddar. I would so love to win this book. Thank you for the chance. Maybe my sewing room would be cleaner if I used this book to use up my scraps. thanks for the giveaway. This looks like a fabulous book - love your blocks too!! Looks like a book I would really enjoy. Thanks - I love all your work - you are such a talented lady! I love the pumpkin peel! I'm partial to red, so that would be my choice. Thanks for a chance to win a wonderful book! Love what you are doing - the size too! What a great book! Looking forward to seeing your completed doll quilt - it looks great! Thanks for the chance to win an amazing-looking book. What an informative post...love the patterns and both backgrounds. I'm loving your small version with the single arcs and like both backgrounds but would probably choose the red myself. I know it will be great either way! Would love a copy of the book - thanks for sharing and for the giveaway! I love the cheddar with the scrappy arcs. Looks like a very interesting book. I'd love to win this book! It looks like a great one! If I had to choose, I'd use the red over the cheddar. I think the arcs stand out better. The book really looks interesting. looks like a great book!!! Thanks for taking part in the blog hop. HI LOOKS SO NEAT>BEEN KEEPING MY EYE ON IT>LOVE TO WIN IT! I would choose the cheddar, but then again I love anything yellow! I would love to win the book also. I can't decided which colour I like better for the background. The red makes it more traditional and the cheddar more modern (at least in my opinion). Looks like another book for my list! Great book! I'd love the tiny pieces quilt. I would love to have this book. Just maybe then I would get around to using up some of my stash. thank you. I have the book so don't count me in. I do love this block you tackled, it's the #1 pattern in this book that I'd like to make. I did make one block of the Molly's star with 1 1/4" finished 1/2 sq tri's. It's super cute. Great book, good luck to everyone! This book looks wonderful. I have plenty of scraps of all sizes to use. I would love to try the one with the arcs that you have started. Thanks for a chance to win. Really cute! I'd go for the red background. Thanks for the iPad tip! Ooh, what fun. I love these. I think I could really get into making these. I would love to win this book - I have so many small scraps that would be perfect for this quilt! I'm still pretty intimidated by small piecing, but I'm trying to branch out! This book looks like a fun one! What beautiful quilts. Thanks for a chance to win this fun book. Me encanta como ha quedado esa colcha y la tecnica utilizada es genial. Ese libro se ve muy interesante. Haber si tengo suerte con él. I love the small arcs rather than the double arc fabric. It looks good more than the other one. This would be a lovely book for me. I have so many tiny scraps just waiting to be made into something beautiful! It looks like an inspirational book to have. Thanks for the giveaway. Red is my favourite colour too. The arcs stand out more with the red background than the cheddar. I've loved watching the process you have used as you've played with this pattern! Very clever! Cheddar please! I have the first book and love itand I am going to buy the new one so please give someone else the chance to win it. Love how you have experimented with it to make it your own. I love small pieces, hello from Slovakia. I Already had a sneak peak in Supergoof's copy of the book, but still love to win this one! Looks like a wonderful book, I would love to win it! Where is the quilterin who doesn't have a lot of small pieces? I would love to win the book, too. Looks like a very usable book. I'd love to be included. Boy, talk about taking the "bull by the horns". You really get after a new project. Fantastic. Can't wait to see the finished quilt. Your tutorials are always so fun to follow. 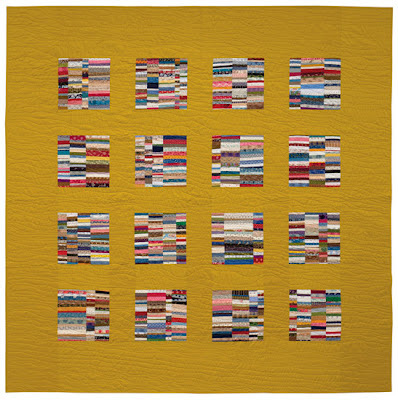 This looks like a really nice way to make quilts with tiny pieces. I love that quilt with cheddar background. Got to add to my collection! Awesome little quilt. I love minis! The pumpkin peel is my favorite quilt as well from what I have seen of the book. I love your version and think it looks great on the red! Looking forward to seeing how your mini turns out. This is just what I've been looking for. 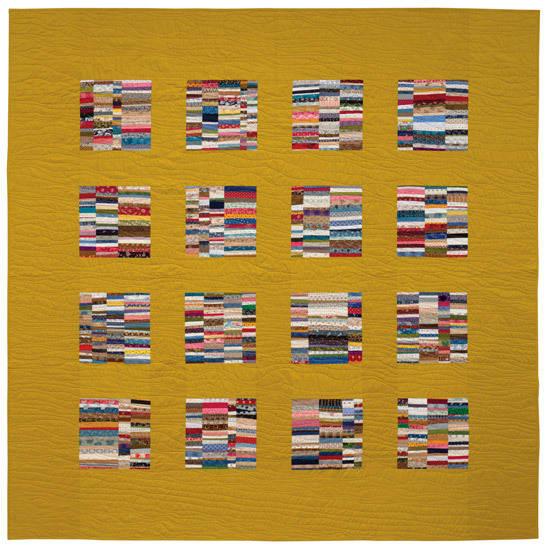 I am amazed by miniature quilts and this book seems to be a great way to get started. Thanks for the opportunity. Yeah!!! Wanna win, wanna win! I love the creativity with small pieces! This looks such a great bok! I love the 'pumpkin peel' pattern! Great idea, to reduce the size of the block to meet your needs. I like how the block is turning out. This is an interesting book, and I would love a chance to win it. Thanks. I love the small pieces and what you can do with them, also I would love a chance to win it. I've been saving my small pieces --- this book looks like it would be perfect for using them. Thank you for the "clue" using the see through paper --- I've done some paper piecing, but this would make it easier. Tough decision between the red and the cheddar, but I'm leaning ever so slightly towards the cheddar. You've given me some great ideas by documenting your "play" with that wonderful block. Thanks for a chance at winning a great book! It looks like you are having a lot of fun with this book. I would love a chance to win a copy. Thanks. Love the IPad tip! (I've been trying to convince my son that I need an IPad--one more argument in my favor!) ;) Looks like an enjoyable book! I've only made one quilt so far (this summer and I'm getting ready to actually quilt it and then bind it), so seeing this process is amazing! Whomever would think a miniature quilt would be easier would be quite mistaken! These are amazing! Red, definitely the red background! Sorry if you've read this before. I don't know where my previous comment went but am sending another one. I had just talked myself out of starting this quilt but now having seen the red version, I'm going to have to make it! Either color background would look good on your doll quilt, but I'm partial to red so I have to say go with red. My choice would be red! The book is great, I would love to win it. What a choice! I like them both- but the red calls to me. And this book looks great- thanks for the giveaway! Would love to have a copy of this book. I'm leaning toward the red background, but both are nice. 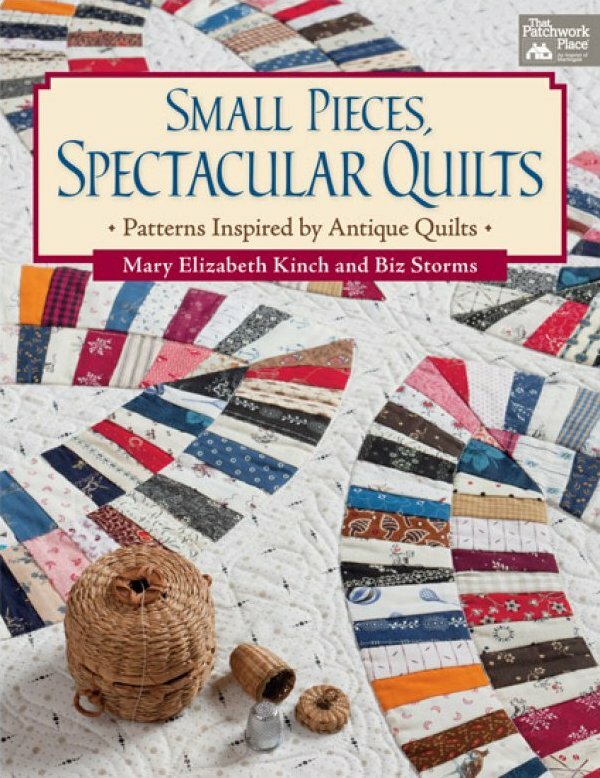 This looks like a great book to have since I'm starting to have a lot of small pieces now that I've started quilting more. To answer your question, I really love the way the arches look on the red much more than the cheddar. Very pretty. I would so love to win a copy of this new book. Wow your project is so pretty. I'd love to add this book to my library. Wow. Fabulous. what a great book. I need to get back to my pickle jar. This makes me want to do another project. Great book review. Go with the cheddar!! Awesome book, great review. I'd love to have that book.Thanks for the chance. So many comments! I'm not a huge fan of red, but I think it stands out so much better with your arcs. Thanks for the tip about using the lighter weight paper. Beautiful work as always. great post and your arcs look great, I love all the shirtings. What fun - you sure know how to play!! Your arcs look wonderful with great fabrics. Why am I not surprised that you shrunk the pattern :0) You must like a challenge. I vote for the red. Oh I never win anything but I had to try. It's a lovely book. Boy, that's a tough decision -- I'm thinking I might like the red background a little better? Me! Me! Please pick me!!! I love their first book!!! That book looks neat, I love detailed piecing. Your pumpkin peel block is awesome! I often shrink quilt blocks too, cuz the smaller ones are so much fun. I can't wait to see this one you're making all finished! your tute is just great, easy to follow, great pix! the book has some great ideas, and you've shown us one can folllow them and make them your own. thanx for the chance to win a copy. I have both books. Just wanted to stop by say Hi and your work looks great! using tearawayvieline sounds like a great solution to one of my dislikes with foundation piecing. Thanks for the tutorial and a chance to win the book. I'd really like a copy of this book. the quilts look lovely and I especially like the one you've chosen to make. I'm looking forward to seeing which background you decide on. Great book and I would to like to win ! I love small pieces and hope to win this book !!!! ¡¡Me encantan los dos!! No escribo en inglés, pero te leo perfectamente.Un beso y gracias por compartir. I'm inspired, despite my phobia related to paper piecing. It is SO hard to get my head around that; maybe it's all the gray hair? Thanks to you for sharing! Teriffic! Now I know why I've saved all those little strips! This one is way up on my bucket list. Thanks for the opportunity to win it. I L♥VE it and am itching to see the rest of the book. I would go for the cheddar colour,so gorgeous!!!!! Love your tutorial about shrinking the size of the blocks. I'm really digging the red background. This book looks great! These two are just amazing, and I was thrilled to see that they have come out with a second book. Their first book is one of my favorites. I cant´t believe the things I´ve seen in your blog! Your work us amazing and your hand quilting is just unbelievable. I´m your follower, of course. String pieced quilts are so much fun, I would like to learn your method. What a lovely book and blog! I visit often and never cease to be inspired. I love the kind of quilting you do!!!!!!! Wow this books looks amazing... I would LOVE to own a book like this. I love the way you play. Can I join? I love your pumpkin peel pieces on the bold red background! The book looks like it would be so helpful in finding ways to use up a scrappy fabric stash. Thanks for offering this great giveaway! I love the quilt on the cover of this book. It looks so Susan McCordish:) I look forward to seeing your new little quilt and thanks for hosting the giveaway. I like red too, especially red bindings. I think a cheddar background with a red binding would be glorious for your quilt. Thanks so much for the tutorial for making this unique block. I'm glad you showed us how you made the template. I will have to give that a try. I would love to win a copy of this book. It looks like one I would use and enjoy. Sally jspwarren at aol dot com. Red or cheddar...what a decision....I haven't worked with cheddar before, so I think I would go for that....book looks great, I am sure there is loads of inspiration in there! I love the Pumpkin Peel pattern--what a great way to use up those little scraps!